Need some colour at the back of your herbaceous border in late summer? 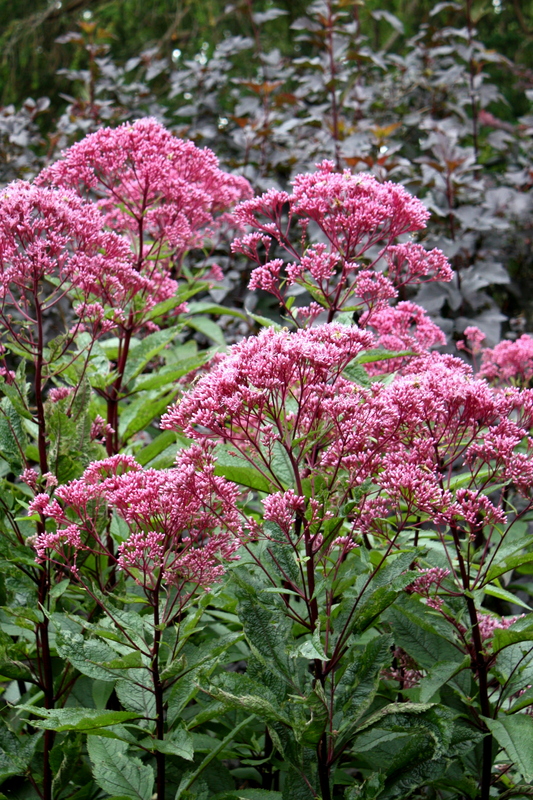 Then look not further than Eupatorium purpureum, otherwise known as Joe Pye weed. The legend of Joe Pye is shrouded in mystery. He may or may not have been a Native American, living in the 18th or 19th century, and is said to have cured people of fevers using the plant that now bears his name. Whoever he was, Joe Pye had an eye for a better class of weed. Whilst Eupatorium purpureum is admittedly a bit of a giant, reaching 7ft when happy, it generally forms an orderly clump and stays firmly where you put it. The purple stems and raspberry pink flowers make a great partner for shrubs with copper or plum coloured foliage, especially Cotinus coggygria ‘Royal Purple’ and Sambucus nigra ‘Black Beauty’. Joe Pye weed is just as happy in a natural setting, where it will attract all sorts of pollinating insects, or in a prairie style planting with other robust perennials and grasses. This is such a beautiful ‘weed’! Thankyou. Beautiful weeds are always welcome in my garden. Well, most of them anyway!